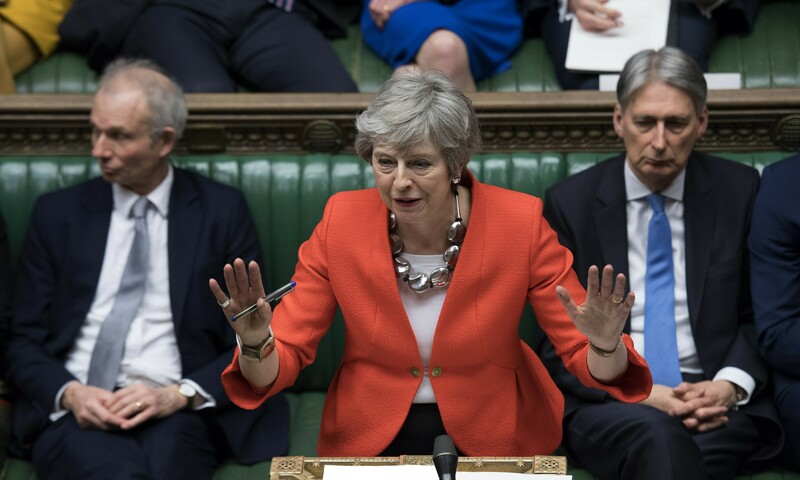 LONDON (AP) — British Prime Minister Theresa May warned Sunday that it would be "a potent symbol of Parliament's collective political failure" if a Brexit delay meant that the U.K. has to take part in May's European Parliament election — almost three years after Britons voted to leave the bloc. Writing in the Sunday Telegraph, May also cautioned that if British lawmakers failed to back her Brexit deal before Thursday's European Council summit, "we will not leave the EU for many months, if ever." May is expected to try to win Parliament's approval of her withdrawal agreement from the EU for the third time this week. After months of political deadlock, lawmakers voted Thursday to seek to postpone Brexit. That will likely avert a chaotic British withdrawal on the scheduled exit date of March 29 — although the power to approve or reject a Brexit extension lies with the EU. The European Commission has said the bloc would consider any request, "taking into account the reasons for and duration of a possible extension." May is trying to persuade opponents in her Conservative Party and its parliamentary allies to change their minds and support her Brexit withdrawal agreement, which Parliament has already resoundingly defeated twice. If she wins that parliamentary approval, Britain's departure from the bloc can likely take place with just a "short technical extension" beyond March 29. Ahead of a third parliamentary vote on Brexit deal, the possibility of Britain's departure being delayed or overturned in a second referendum appeared to be swinging some Eurosceptic lawmakers reluctantly behind May. Former Cabinet minister Esther McVey, who resigned over the Brexit agreement, told Sky News on Sunday that she would back May's deal now because "the choice before us is this deal or no Brexit whatsoever." Opposition Labour leader Jeremy Corbyn said Sunday that his party is against May's Brexit deal — but indicated that Labour would back an amendment that supports the EU divorce deal on condition that it is put to a new referendum. Corbyn has written to lawmakers across Britain's political spectrum inviting them for talks to find a cross-party compromise on Brexit. He also told Sky News that he may propose another no-confidence vote in May's minority government if her Brexit deal is voted down again. May's government was continuing talks with Northern Ireland's Democratic Unionist Party, whose 10 lawmakers provide the crucial supporting numbers to keep May's Conservatives in power.